I have been messing around with the font style and size on my blog and for some unknown reason extra line spaces have started inserting themselves. No matter what I do I just cannot seem to get rid of them. So please excuse the weird spacing - I am trying to figure it out! Blogger does seem to be misbehaving today - wrongs dates and all sorts of funnies!! Whilst on my Autumn cleaning mission my ideas got a bit of a clear out too ! This was initially supposed to be a cushion (made from Chunky yarn), but after about six attempts at the gusset I gave it up as a bad job. I was about to frog the idea altogether then I thought - HEY!!! - Owl Trivets for my daughter's kitchen! Could work?? 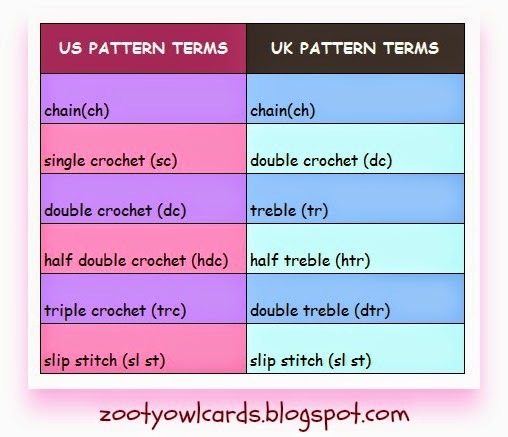 My patterns are all written in US terms - I have included this little chart to make it easier for my UK readers to reference the difference in stitch terms. Use whatever hook size suits your choice of yarn and your tension. Row 2: join yarn in any dc; 3ch, 1dc into same place as join; 2dc into each of next 11dc (12 x 2dc groupings = 24dc), sl st into top of 3ch at start to close, break off yarn. Row 10: Join yarn in 1ch sp between two 4dc groupings; 3ch (counts as 1dc) in same 1ch sp as join; 1dc into each of next 4dc; (1dc into 1ch sp bet two 4dc groupings; 1dc into each of next 4dc) repeat to end; sl st into top of 3ch at start to close. Foundation: navy, black or dark brown yarn - 4ch, sl st into first chain to form a circle or make a magic circle. Row 1: 2ch (counts as 1hdc) into same place as sl st; 9 hdc into circle; sl st into top of 2ch at start to close (10hdc); break of yarn. Row 2: blue or green - Join yarn in top of any hdc, 2ch (counts as 1hdc), 1hdc in same sp as join; (2hdc into top of next hdc) x9, sl st into top of 2ch at start to close (10 x 2hdc groupings = 20hdc); break off yarn. Row 3: white - Join yarn between any two 2hdc groupings; 3ch (counts as 1dc), 2dc into same sp as join; (3dc into each next space 2hdc groupings) x9; (10 x 3dc groupings = 30dc); sl st into top of 3ch at start; break off yarn. Row 3: 1ch, 1sc into same place as sl st; 1sc into each of next 3 stitches; 2sc into next st; 1sc into next st; 2sc into next st; 1sc into next 3 st; (1sc, 1hdc, 1sc) in next st; 1sc in next 4st; 2sc into next st; 1sc into next st; 2sc into next st, 1sc into next 4st; sl st into first sc to close. Break off yarn. Detail: Rejoin yarn in a contrasting colour with a sl st. sl st into each st around beak, break off yarn at last sl st.
With a tapestry needle, pull the yarn through from front to back on the first ss, pull to tighten neatly. then thread the yarn through the back loops on the next few ss. Weave in to secure. Left Foot is worked into the space directly before a 4dc grouping, and then over the 4dc grouping. Row 2: Ch 3, 3dc into first 1ch sp; sl st into next 1ch sp, 4ch, 3trc into same sp as sl st; sl st into next 1ch sp, 3ch, 3dc into same sp as sl st; sl st into next 1ch sp, break off yarn. Rows 5 - 10: For each subsequent round continue to do 2dc into top of 1st of "double" dc of the previous row; 1dc into top of 2nd of "double" dc; 1dc into each single dc. This means that every row increases by 12 stitches - thus keeping the work flat. EYES and BEAK worked as for the Mandala Version. FEET as for the Mandala Version, but the 5dc spikes are worked into the spaces between 5 consecutive dc. Will post a photo when I have had enough fun decorating this one! This line stuff makes me so mad!! I also have uneven spacing between photos sometimes .... Is there a contact somehow to Blogger to complain? These are so cute. I hope you don't mind if I pin it to make later. Thanks for sharing the pattern. You are so talented. No problems with the font/spaces here ! I am happy your font is larger though as my eyesight is getting terrible lately .. so thanks for that ! These are .. as you know .. gorgeous. That word is often overused but with your crochet ? No .. it's well deserved!!!!!! These are ALL so cute! I'm a beginner and only know a couple crochet stitches from being shown; I don't know how to read and work pattern instructions it makes no sense to me any suggestions on how to learn to read and do the work? Thanks!!!! DeeDee, I have been crocheting for years - but only know a few stitches too from being shown. I have found (for me) it's much easier if I take one little step at a time. I only read and follow a few words at a time. I hope to improve on this, but for now, this is how I do it. Just absolutely love this!! I have been going round and round trying to find owl placemat patterns that I like and this one is it. I can use the colors I want to match my kitchen and it is so cute. Best I have seen! Thank you for sharing this pattern. If I can help you with a donation for the pattern or anything please leave me a message and we can go from there. Boy we sure have come a long ways since I first learned to crochet at 17 years of age. I am now going on 57 so almost 40 years now. I just love this. These are so cute! Thanks so much for your easy-to-understand directions. I am new to reading crochet patterns and yours was well-written. Usually they overwhelm me but I could follow yours! Thanks for sharing! Your work is beautiful and you and so many others are so generous to share them with us...because of your tutorials (and a few others) I've been able to increase my crochet skills.in the last few months...gone from beginner to probably advanced intermediate....can read (most) charts and can figure out some patterns just by looking at good pictures of the item...THANK YOU so very much! with fixed income, I could not afford to take classes to do this....but because of the generosity of experienced, skilled crocheters such as yourself, those in my position have been so Blessed! Awesome pattern! Thank you for sharing it! The Owls are adorable! 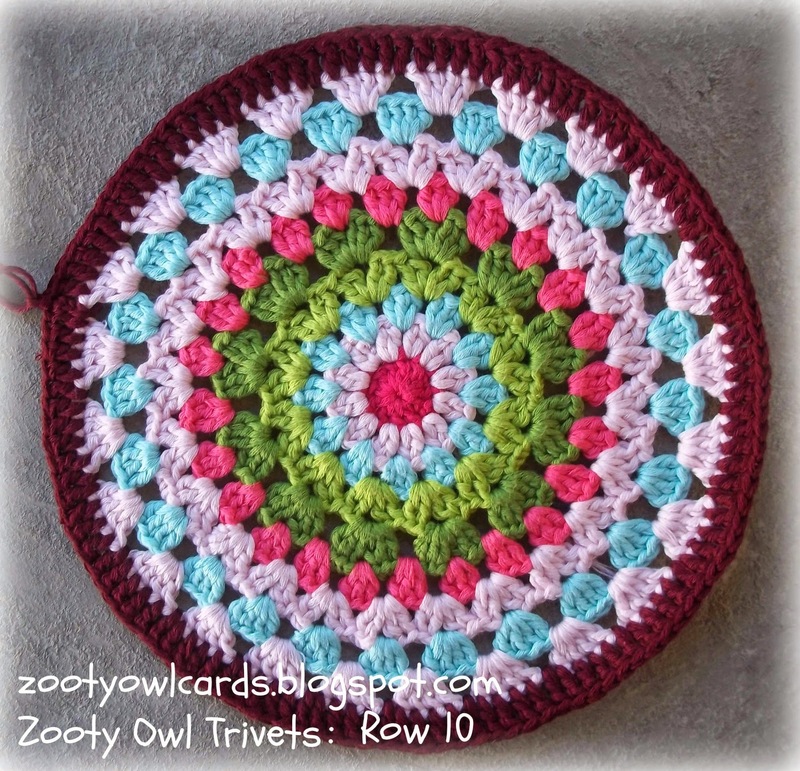 Very nice tutorial, especially photos for those who actually can crochet. You made quite a job with it. Thank you! I like japanese and russian crochet ( and sewing, knitting etc.) patterns 'cause they are easier to follow than all all those with lots and lots of text. Luv your Owl, Thank you for sharing tutorial. Wonderful Owl! Thank you so much for sharing the pattern ♥ I'll love it to make one.. Have a great day! This is so clever. The best I have seen. Thanks for the pattern. Since i have start to crochet i see this kind of owl everywhere. I like yours, i add it in my crochet project queue. How cute! zthis would make a great gift! This is so cute! They would make nice gifts for a bride to be. Thank you for posting your pattern. You are so amazing!! Thanks for all the different styles! And colors!! I thought you were done and then there was the solid!!! Lots of time and effort! Continue to amaze us please!! Thanks for the tutorial! That you so much for taking the time to write out the instructions and add photos. It's greatly appreciated. Your owls are just too adorable and I can't wait to make them. Happy Crocheting!!! I love this pattern and I also appreciate the larger font. I plan to make a few of these for gifts. I have no idea if my feet are correct, but I finished an owl today. It is such a cute project; thank you for sharing it! I made both opened and closed. Thank you for this pattern. Thanks for the great pattern!! I really enjoyed making them. I took the pattern for the mandala front and the solid for backs and made pillows. I used a single crochet triangle for my beak because no matter how hard I tried, I couldn't get your version of the beak to look right. INCHE'S " along with cm when telling sizes when finished, Thank you for all your hard work! 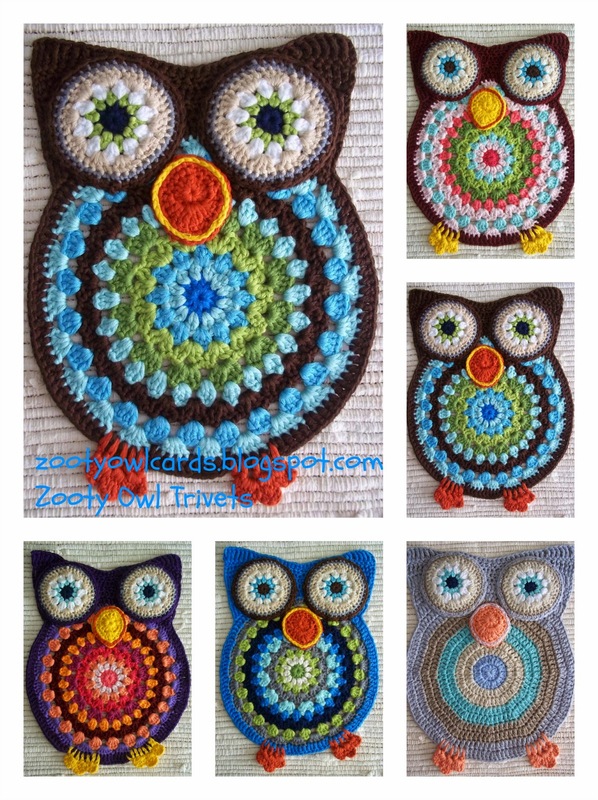 I'm making a road trip scarf now an then will make owl trivet, Thank you again! Love your owl pattern and so well explained too! in row 6 do you need to do in between the chain 1 and between the clusters? trying to make this today but got stuck at this point? Awsome owls, great pattern.thank you so much. Hi could the owl mandala's be worked in worsted weight/ Aran yarn and in 100% acrylic ? Hi Amanda. You could use whatever thickness of yarn suits you - I have seen this pattern made in T-shirt Yarn for floor mats. If you are going to use it in the kitchen, I would recommend you rather use a cotton yarn, otherwise acrylic is perfect! I am working on mine for a dear friend who is an owl lover. It is curling under. Is this normal? What am i doing wrong? Hi Nikki! Sorry I took so long to get back to you. You could try using a bigger hook on the outer rows. Send me a close up pic on Zooty Owl Facebook page if you still need help - so that I can check where the problem lies. Made this pattern for my niece who loves owls....I reduced the size somewhat.